RFA WAVE KNIGHT (A389) built by VSEL BAE Systems Marine, launched in 2000 and accepted into service in 2003. She is the second ship to bear this name in RFA service. She is crewed by 72 RFA personnel while there is also provision for 26 Royal Navy personnel for helicopter and weapons systems operations. Wave Knight can support amphibious forces, anti- surface, anti-submarine warfare operations and protect vital sea areas and shipping. She has the capability to deliver fuel to other vessels, through a RAS (replenishment at sea) rig, both port, starboard or astern. For amphibious support, the ships can also deliver fuel to pillow tanks or dracones positioned alongside. 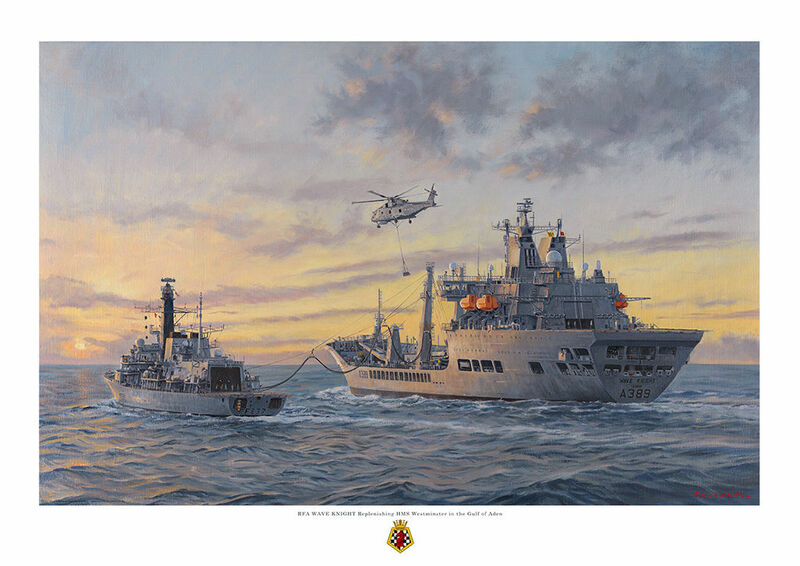 She is shown carrying out a RAS with HMS Westminster in the Gulf, the painting was commissioned by the commanding officer of RFA Wave Knight.